Paula Kellinger is Professor of Dance at Wilson College in Chambersburg, PA, a position she has held since 1995. Prior to teaching at Wilson College, Paula danced for such choreographers as Meredith Monk, Laura Dean, Susan Rethorst, Wendy Perron, Brendan McCall, and as an apprentice for Trisha Brown, alongside creating her own body of choreographic work. As a dance instructor she has guest taught at the Kanon Dance Company/Academy (St. Petersburg, Russia), Salzburg Experimental Academy of Dance (Salzburg, Austria), Academia Del’Arte (Arezzo, Italy), Universita Perugia (Perugia, Italy), and as adjunct professor at Gettysburg College. Paula formed the workshop series SUPA with Susan Rethorst, a yearly summer choreography-based program hosted by Wilson College. 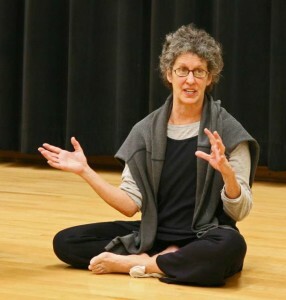 Throughout her career as a professor and choreographer, Paula has received numerous awards including the Donald Bletz Outstanding Teaching Award (2012, 2000, 1997), a NEA Choreographic Fellowship (1999), PSCA Choreographic Fellowship (1999, 1996), and Wilson College Research Stipends (2011, 2008, 2002). Paula holds a MFA in Dance from Sarah Lawrence College and a BFA in Dance and BA in Sociology/Anthropology from Adelphi University.